If you are like me, then you don't have too much trouble imagining cognition as a network phenomenon: all thoughts, visions, dreams, calculations are based on the spidery webs of firing neurons flashing in unique patterns like lightning through our brains. I can imagine, then, some peculiar and unique flash of lightning in my brain each time I think of, for instance, Connectivism. Each time that flash of lightning fires, my brain creates the concept Connectivism, and re-traces those routes along those particular neurons, across the various regions of my brain, traversing both hemispheres, so that I can think Connectivism. In this scenario, a particular flash of brain lightning equals a particular concept, and I can reinforce that concept by flashing it again and again in different contexts until I firmly etch the pathways into the circuitry of my brain. Nice image. Sporns concludes that "functions do not reside in individual brain regions but are accomplished by network interactions that rapidly reconfigure, resulting in dynamic changes of neural context" (183). This suggests to me that any given bit of cognition depends very much on the interaction between the bit of cognition and the neural context within which it immediately finds itself seeking expression. Sporns says that "the functional contribution of a brain region is more clearly defined by the neural context within which it is embedded [and] this neural context is reconfigured as stimulus and task conditions vary, and it is ultimately constrained by the underlying structural network" (183,184). So what is the takeaway lesson here? For me, it is this: the brain is a most complex orchestra of two parts—a right hemisphere jazz band and a left hemisphere classical orchestra, and each time it expresses the concept Connectivism, it chooses different instruments and different musical arrangements, depending on what the rest of the orchestra, and the conductor, and the audience are all doing. Sometimes, the concept Connectivism may find expression in my brain from the classical side, expressed mostly with woodwinds and a single flute. At other times, the concept may find expression from the jazz side, expressed through a wailing saxophone, a drum kit, and an electric fretless bass, with some contribution from the classical brass section. Either way, or in some other way, I can still recognize the musical motif: the idea Connectivism, but it is not the same network pattern expressed invariably each time. Each time it is expressed, Connectivism is something slightly different, even in my own mind. This reminds me, of course, of Edgar Morin's view of complex thought, that "the intelligibility of the system has to be found, not only in the system itself, but also in its relationship with the environment, and that this relationship is not a simple dependence: it is constitutive of the system" (11). Sporns' research into neural networks reveals to me that complexity functions in the brain's production of a single thought which depends on the interaction of any defined unit with its enclosing unit and with all the other units that it encloses and that enclose it. A concept depends on the interaction of a given neuron with its brain region, that brain region with the other regions, all those regions with the brain, the brain with the rest of the body, the body with its enclosing groups, and so on. "Cognition has an anatomical substrate" (205). "Integration involves dynamic coordination (synchrony, coherence, linear and nonlinear coupling) as well as convergence" (205). "Stimuli and cognitive tasks act as perturbations of existing network dynamics" (206). I find it easy for my own New Age imagination to posit some cosmic Mind emerging from the idea of cognition as network, but Sporns assiduously avoids any hint of the New Age, keeping his conversation firmly grounded in the physical anatomy of the brain and its observable and verifiable behaviors. As he says, "All cognitive processes occur within anatomical networks, and the topology of these networks imposes powerful constraints on cognitive architectures" (205). These neural networks have "small-world attributes" that are similar to other networks that are perhaps more familiar to us: social networks, the Internet, Wikipedia, or gene networks (Small-world network). Small-world networks are characterized by clustering, which groups nodes about a more well-connected node, thus facilitating quick connectivity to most any other node in the large-scale network. This is similar to the way Google works on the Net: it is a well-connected node that reduces the hops between us as individual nodes and most any other node on the Net. It may be the way an orchestra works with clusters of violins, bassoons, and drums, with a lead violinist about whom the other violins cluster and who connects those violins to the rest of the orchestra. This small-world architecture means that cognitive processes are both segregated and integrated. An act of knowing relies on segregated clusters of neurons firing in different regions of the brain (different instruments sounding in different regions of the orchestra), and these segregated firings are then integrated (apparently within milliseconds) into a coherent thought, much like all the sounds of the orchestra. Which brings us to Sporns' second trait of cognition as network phenomenon. The brain apparently has a couple of mechanisms for integrating segregated patterns of neuronal firings into a coherent whole pattern. First, the brain can synchronize neuronal firings, or perhaps the better way to say this is that the neurons can synchronize themselves, much as a jazz band can find its way back to a chord progression, time signature, or tune to synchronize the various flights of solo fantasy. Then, various firings can converge in a particular firing which takes the inputs and feedforwards them as a single input. I do not understand neurophysiology well enough yet (perhaps never) to understand how synchrony and convergence work in the brain, but I understand the import: the brain is an incredibly rich orchestra of instruments which can sound or not, in unison or not, according to an internal rhythm, pitch, timbre, tone, and volume, and the brain's clusters of instruments—say, the woodwinds—can converge to create a single tone amongst the tones from the other regions of the orchestra. Every single instrument is vital to the orchestra, but no single instrument makes the orchestra. Every instrument must maintain its own integrity (the trumpet must not try to become a cello) just as surely as it must find its place in the orchestral network. I think Sporns is using perturbation in its scientific sense as a variation or deviance in a system caused by some outside effect, and this is perhaps the most amazing trait of cognition as a network phenomenon. We in education typically think of external inputs (classroom lectures, for instance) as the most important aspect of learning, yet if Sporns is correct, then external inputs are best seen as an interruption of or as a more-or-less complimentary addition to the internal system. As I noted in a previous post, any external input must earn its place in the orchestra. An external input hardly ever totally supplants the music the orchestra of the brain is already playing, except in the case of trauma or other profound experiences. Of course, anyone who has ever tried to get the attention of twenty-five kindergarteners (or of twenty-five kindergarten teachers, for that matter) knows how difficult it is to keep them focused on your external input, whatever it is. This, it seems, is the natural state of things. Education is not the systematic, mechanical input of data into the blank data banks of students' minds; rather, education is an attempt to join and to modulate the tunes already playing in our students' minds. Surely these two processes are radically different and require radically different pedagogies. I continue to revel in Olaf Sporns' wonderful book about neural networks: Networks of the Brain. In Chapter 8: Dynamic Patterns in Spontaneous Neural Activity, Sporns examines the dominant model in brain studies that says brains are mainly structures for receiving, processing, and then responding to sensory impressions from outside the brain (eyes, ears, skin, etc.). As Sporns says, "This theoretical framework treats the brain as a system in which the essential neural process is the transformation of inputs into outputs" (149). If I understand Sporns correctly, then this view of the brain borrows heavily from computer information theory: signals from keyboard and mouse are input to the CPU, which then processes the signals and outputs a result in the form of another signal, or: I press the A key on my Macintosh PowerBook Pro's keyboard, then the internal 2.53 GHz Intel Core i5 chip processes that signal, and finally it outputs signals to the screen to display the letter A. In the view of traditional neuroscience, then, my brain is like the Intel Core i5 chip: a more or less efficient processor of sensory input into motor output. This is a simple view of brain activity, and it is consistent with a Newtonian worldview that sees reality as a machine: a collection of parts with regular, reliable, and highly predictable interactions in which cause and effect are necessarily linked. If I press the A key on my computer keyboard, then the CPU will process that signal and it will cause A to appear on my screen. If this doesn't happen, then the machine is malfunctioning and requires repair. Or … if I teach (input) the technique for handling in-text citations according to the MLA Style Manual, then my students (CPUs) will process that input, and they will necessarily output papers that properly handle in-text citations according to the Modern Language Association's authoritative guide. If they don't, then their machines (brains) are malfunctioning and require repair (further teaching). If I'm a particularly sensitive and liberal teacher, then I might suspect that the teaching/learning process could be broken elsewhere—say, with my teaching technique—but I will not likely suspect that the entire mechanistic process itself does not adequately capture the reality of how students might learn to do in-text citations according to the MLA. For two hundred years, both neuroscience and teaching have focused on a mechanistic model of input -> processing -> output, and this model has, indeed, taught us much about both brains and learning, but in the end, this model is too limiting. As Sporns says, "Until now, much of the interest in theoretical neuroscience has focused on stimulus-driven or task-related computation, and considerably less attention has been given to the brain as a dynamic, spontaneously active, and recurrently connected system" (149, 150). So what happens if we begin to consider students as dynamic, spontaneously active, recurrently connected systems? Sporns explains why, despite its huge and continuing contributions to neuroscience, this mechanistic view does not adequately capture the reality of brains and, by my extension, the reality of students learning MLA techniques. Sporns provides strong research that suggests that the majority of neural activity is not in response to external input through eyes, ears, nose, tongue, and skin or output through motor and cognitive functions. As he says, "Whether considering individual neurons or entire brain regions, one finds that the vast majority of the structural connections that are made and received among network elements cannot be definitively associated with either input or output" (150). This raises at least the possibility that, similarly, most learning is not in response to either input through instruction or output through homework and papers. Rather, the brain seems to spend much of its time self-organizing, partly in response to external inputs (nurture) and partly in response to internal physical structures (nature) but, perhaps, mostly through its own processes of maintenance and tweaking. As Sporns says, "Spontaneously generated network states form an internal functional repertoire. The observation and modeling of endogenous or spontaneous brain activity provide a unique window on patterns of self-organized brain dynamics—an intrinsic mode of neural processing that may have a central role in cognition" (151). The brain does not merely and automatically intake and process external inputs (say, teaching about MLA); rather, external inputs must "earn representation via their impact upon the pre-existing functional disposition of the brain" (151, Sporns quoting Rodolfo Llinás). I like that: external stimuli don't just automatically find a place within our brains; rather, they have to earn a place among the stuff that is already there. Thus, merely showing up in class and lecturing about how MLA handles in-text citations does NOT guarantee a place for my lecture in any student's mind. It doesn't even suggest a place. Rather, my lecture must "earn representation via [its] impact upon the pre-existing functional disposition of the [student's] brain." What's more, while the relationship between my lecture and one student brain is complex and dynamic enough, I likely have thirty students, all with differing "pre-existing functional dispositions" in their brains. Now, we're really beginning to appreciate the complication and complexity of learning. How does one teacher awaken in the different minds of thirty people even so simple a concept as in-text citations according to the MLA? Does it even make sense to ask that question, putting the onus of learning simply on the teacher as if she can stamp out knowledge from brain to brain? Well, it's Sunday morning, and I'm just getting to the essential questions for me, but I'm also in the middle of repainting the guest bathroom, a task my wife really wants me to finish. Her desires are definitely earning representation via their impact upon the pre-existing functional disposition of my brain. I will, of course, talk more about neural networks and education later. In a previous post, I tried mapping my knowledge of Connectivism. I created a couple of static images that showed how I related to various other entities in the network of concepts, people, and experiences that make up my knowledge of Connectivism, but even as I posted these images, I complained that they were not quite dynamic enough. My sister, introduced me to a new mapping tool called SpicyNodes that seems to do a better job of capturing at least some of the dynamism that I sense in knowledge networks, so I started again mapping what I know of Connectivism—in part to learn SpicyNodes and in part to learn Connectivism. This is my first attempt, but I share it with you because I think it works well enough. Note that unlike my earlier static images, this SpicyNode allows for a shift in perspective as one traverses the network. This is important. 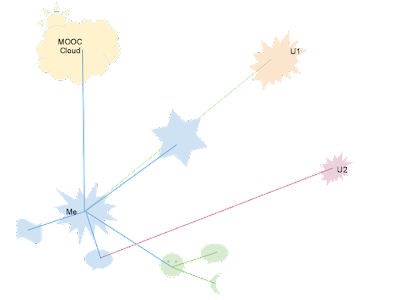 This SpicyNode, for instance, begins with the Connectivism node in the middle. Keep in mind that this was a rhetorical decision on my part. There is nothing inherent in the Connectivism node that makes it the starting node of this network, or even the key or central node. I just happened to start there. I could have started with one of the other nodes: me, Stephen Downes, George Siemens, but I didn't. Rather, I made a rhetorical, political, logical choice to start with the Connectivism node for this particular SpicyNodes text. I should not confuse my choice of order among the nodes with the natural order (if there is one) of the Universe. Even this small collection of nodes is a rhizomatic structure in the sense that Deleuze and Guattari suggest: it has no center, no president, no controlling concept, except the one that I (or you) give it. My choice is mine, and in this particular case, was likely influenced by the fact that I'm enrolled in the CCK11 MOOC: Connectivism and Connective Knowledge. So I started with the Connectivism node, but in SpicyNodes, I can move to another node, and the network magically rearranges itself about the new center. This captures visually a delicious interaction between knowledge and point of view. Our knowing at any given time depends on our point of view at that time. 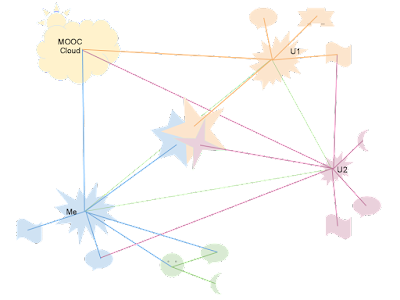 Click on Stephen Downes in the SpicyNode above, and see how the whole pattern of knowledge about Connectivism rearranges itself. Click on George. Click on the subnodes. The pattern shifts. There is no knowledge, then, of Connectivism—there is only a knowing of Conenctivism from a particular point of view. This would seem to break us apart into isolated silos of knowing, but while isolation does occur (Us: the Wall should come down, and Them: the Wall should stay up), it is neither inevitable nor permanent. In his book On Complexity (2008), Edgar Morin says that we must engage other points of view through dialog, not with the aim of reconciling our points of view through some Hegelian dialectic, but with the aim of understanding, accommodating, and perhaps sharing our points of view through a Morinian dialogic. We must accept that knowledge cannot calcify into absolutes of inviolable patterns, tiny dialectics falling like mollusk shells to a sea floor; rather, knowing must remain a dynamic dialog with others, always conducted from the center of our own point of view but with conversations like cellular filaments arcing among all the different points of view to permit a shared conversation that mutually informs all points of view. For me, at least, this captures the idea behind MOOC CCK11: a dynamic dialog, mostly in writing, that permits a shared conversation that informs all points of view without trying to make them all the same (a useless task anyway). Last night I posted some thoughts about the network nature of knowledge. While describing how my own understanding merges with understanding at a higher level, I used the metaphor of my voice joining a choir, and I said that "as my voice moves into a choir, my own unique tone and tenor becomes blended and a different voice emerges, a group voice." Even as I wrote those words last night, I was uncomfortable with my choice of the word tenor. It is not a wrong word or even an inappropriate word for the context, but it is not exactly the word that I was looking for, so I was uneasy with it. However, the evening was getting late, I was getting sleepy, so I moved on, ignoring the word. I was awakened early this morning in a hotel room in Chicago by the word I was looking for: timbre (the quality given to a sound by its overtones, as (a): the resonance by which the ear recognizes and identifies a voiced speech sound (b): the quality of tone distinctive of a particular singing voice or musical instrument). This is the word I was looking for. It preserves the euphony that I was looking for—the consonance, assonance, and alliteration—and it has the more useful meaning of overtones, or echoes, that better captures the image I want of patterns echoing into other patterns. We are all familiar with this kind of thing. We go to bed worrying with some issue only to awaken in the morning with the answer. Common enough. But here's the question relevant to my discussion of networks, especially neural networks: where did this answer come from? I was asleep, unconscious. Who figured this out? Who continued to look at tenor, recognized it as a near miss, looked for the alternative, and then woke me to give me the answer? uberMe? And who is this uberMe? The unconscious mind? That isn't a very enlightening answer. So much of the brain's activity, even vision, has little to do with sensory input or output; rather, it has to do with the brain's internal creative, organizing, sense-making functions (at least, that's how I'm interpreting Sporns' comments). And this activity is quite independent of my conscious mind, or awareness, which seems to be heavily dependent on the sensory side of the house. Knowledge, then, even that knowledge easily identified with my own brain, is under the influence of forces and processes of which I have very limited control or conscious awareness. There is an uberMe, an unterMe, which is also at work, and apparently does not tire and require sleep as does the conscious littleMe does. Hmm … this requires more thought by all the Me's in me, but now I have to go to a conference session. Later. I think that the concepts of complex networks that I've gleaned so far from Morin and Sporns and of decalcomania that I've taken from Deleuze and Guattari lay two cornerstones for my emerging view of knowledge and learning. First, complex networks suggest that knowledge is not a single thing, or single think (sorry, I couldn't resist, and I may yet edit this awful wordplay); rather, knowledge is a network of patterns enclosed by larger patterns and enclosing smaller patterns. Any given knowledge pattern is constantly open to the dynamic interactions of all those other various patterns on their various levels. This reinforces Morin's admonition that we define any entity—a cell or a word, say—not from its boundaries inward, but from its center outward. Or better yet, we should define a cell from its center both inward and outward. The center of the cell is not an endpoint of definition; rather, it is the starting point of definition, and to understand the cell, we must move from that center both outward to larger patterns and inward to smaller patterns. The cell must be understood as itself and as a part of an enclosing ecosystem and as an ecosystem for other entities, all dynamically interacting with each other, affecting each other and being affected by each other. Any given knowledge is like this cell: recognizable and addressable as itself, and yet not completely understood without consideration of its constituent parts and its ecosystem and of the ways that it interacts with both those micro and macro scales. Thus, my knowledge of Connectivism is in fact a pattern of neurons, but that is just a starting point. Moving inward, that pattern of neurons encloses various patterns in different regions of the brain. Each of those patterns encloses individual neurons and individual electro-chemical processes, which enclose individual cells and electrical charges, which enclose other things, and other things, and other things, all the way down to quarks and strings, and maybe beyond that if we ever develop instruments that can see that far in. Back to our starting point and moving outward, the pattern of neurons that is my knowledge of Connectivism is enclosed by my conversation in MOOC CCK11 (among numerous other conversations I'm having—for instance, this blog), which is enclosed by an ecosystem of larger thought about education, which is enclosed by a larger system, and then a larger system, and then the entire Universe, and maybe beyond that if we ever develop instruments that can see that far out. To understand completely my knowledge of Connectivism, then, I must understand everything else. This, of course, is absurd silliness. It is also our hope for the future. There is no end to learning anything, so we should never be bored. However, in the everyday discourse of common day, we simply can't let a single cell or bit of knowledge bleed into everything else in the Universe, even though it is quite literally connected to everything else in the Universe. A cell or an idea must in some useful way be recognizable and describable and must have potency in and of itself. How do we get out of this predicament? Perhaps Nicholas A. Christakis and James H. Fowler have an answer for us in their book Connected: The Surprising Power of Our Social Networks and How They Shape Our Lives (2009). In describing how social networks work, they note that the influence of people extends out to about three degrees of separation. In other words, the patterns of our own lives influence our friends, our friends' friends, and our friends' friends' friends. After that, the potency of our patterns of behavior and belief fade and lose their efficacy. Perhaps some mechanism similar to this is at work among the various levels of patterns of any given entity. What do I mean? Well, consider my knowledge of Connectivism as a single cell. My knowledge is still a recognizable entity with some potency within the context of this blog, though this blog also discusses other things. My knowledge is still recognizable and potent within the context of MOOC CCK11 and the larger discussion about Connectivism, but I think you an begin to see that my unique knowledge is beginning to fade in this larger conversation as it joins to and is overwhelmed by more voices and stronger voices. As my voice moves into a choir, my own unique tone and tenor becomes blended and a different voice emerges, a group voice. Connectivism means something different at this scale. Though my own meaning may still be recognizable, at two or three degrees removed from my single voice—my single understanding—the unique pattern of my knowledge begins to fade into the wider pattern of the general conversation about Connectivism. When we move up to a larger choir—the discussion of education in general—then my voice is quite lost, its identity and potency subsumed by and faded into the cacophony of voices. There are still a few voices potent and identifiable at this scale—Dewey, Piaget, Bloom, etc.—but most voices have long since drowned. Thus, while I can trace the connections of my single knowledge about Connectivism to infinity and back (assuming I have the time, patience, focus, tools, and skill set), it makes great sense day-to-day to speak of my knowledge of Connectivism as a unique, identifiable entity with its own potency and contours and center. Being an English scholar, I think this entity is something of a convenient fiction, but it makes life much easier to manage. I'll talk next post about decalcomania. 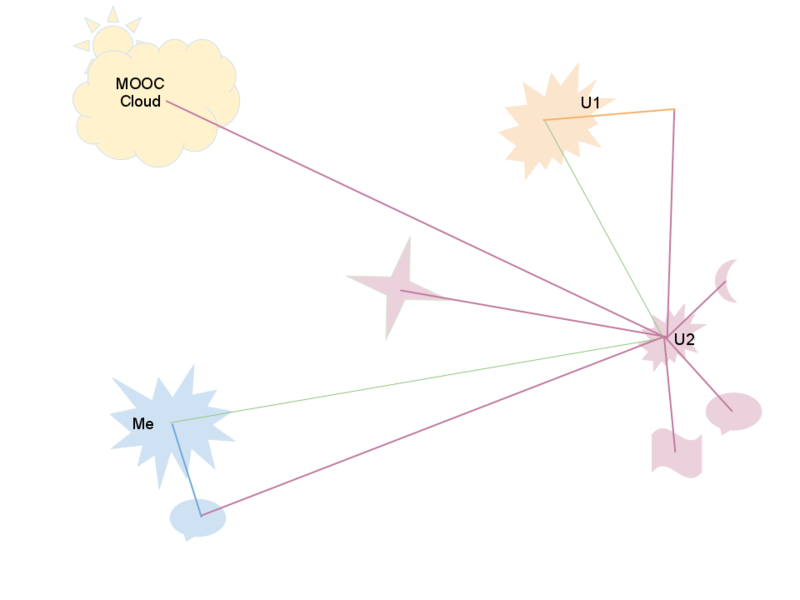 I started trying to map my knowledge about Connectivism in Figure 1. Those of you in CCK11 will immediately recognize a heavy debt to Stephen Downes' illustration about the meaning of Paris. My understanding of Connectivism is represented by the six-pointed star in the middle of the image and is surrounded by people and resources that have contributed in some way to my understanding. My understanding is not one thing, even though the six-pointed star seems to suggest that it is. Rather, it is the dynamic pattern created by the retro-interactions of various people, some of whom know about Connectivism and some who don't, the CCK11 MOOC, readings, some of which are about Connectivism and some which are not, conversations, and my own critical analysis. No one of these things is sufficient to explain my concept of Connectivism; however, all of them are necessary. It is easy for me to see in this image how just my understanding alone at this level is a complex activity: understanding is the emergence of an idea from the interplay of various patterns of meaning to create a new pattern which takes on intelligibility and a stable core even as it continues to develop and grow in meaning from the center out and even shifts its center from time to time as drastic new patterns occur. In other words, as I keep listening and talking, reading and writing, drawing and thinking, the six-sided star of my understanding of Connectivism defines itself from the core outward, gains its own identity and presence, and begins to interact with the other patterned elements in its field, affecting and being affected, or to use the term of Morin: retro-interactions. Complex, yes, but really only just the beginning. If I add the concepts of others—for instance, those of you in CCK11, represented by U1 and U2—then you can see how each of your understandings of Connectivism (represented by the four- and five-pointed stars) starts to interact with my own understanding, and the image becomes even more complex. What immediately impresses me is that none of us can have exactly the same knowledge of Connectivism. We all come at the concept from different angles and with different concepts, different neural pathways, different understandings of teaching and learning, different emotional fields, different connections to others and to other resources. This seems so obvious as almost to be not worth saying, yet our educational system is predicated on all students learning the same things, at the same time, through the same lessons, and monitored by the same tests. This assumption of standardization is simply wrong. Consider U2's understanding of Connectivism in Figure 3. It looks nothing like my own understanding. Indeed, there is only an overlap where U2 and I share somewhat similar patterns and some common resources, but both U2 and I have lots of patterns, people, and resources that contribute to our understandings that don't directly contribute to each other. U2 and I cannot possibly have the same understanding. How can we communicate, then? Well, as near as I can see, communication lies on the borders between the miraculous and the impossible, and the best that U2 and I can manage is a functionally similar understanding. We cannot share an exact understanding. There is no chunk of knowledge that we can both swallow mentally and then say, "Yup, you've got it! Exactly!" The best we can do is to continue in dialogue (in all its various manifestations) until we both create functionally similar patterns of knowledge that allow us to say, "Yeah, that's pretty much what I mean." Then as if this wasn't complex enough, I'm reminded what Sporns says about the various layers of networks: "Networks span multiple spatial scales, from the microscale of individual cells and synapses to the macroscale of cognitive systems and embodied organisms. … In multiscale systems, levels do not operate in isolation—instead, patterns at each level critically depend on processes unfolding on both lower and higher levels" (2). Thus, within my own mind, a similar complex network of patterns is churning and emerging, and this level affects the churning and emergence of knowledge at the wider level of the MOOC, and in turn, the MOOC level is affected by the wider discussions of education, chaos, complexity, and so forth. These wider discussion are themselves part of a larger ecosystem of discussion about society, politics, and economics, which are themselves elements within language and thought throughout the Ages. And on, and on. Worlds within worlds, patterns within patterns, all self-similar at each scale. All dynamic within their own scales and adding to the dynamism of all the enclosed and enclosing scales. Finally, if I really wanted to capture a sense of this complexity, then I would have made a movie that captured all these patterns at all the various levels growing, fading, clarifying, and fragmenting as they interacted with elements in their own scale and with the other scales. I don't know if I have the technical talent to create that movie, but I definitely don't have the time just now. Maybe later. It'll be impressive, I think.